PRINCE2 is a process-based approach for project management providing an easily tailored, and scalable method for the management of all types of projects. Each process is defined with its key inputs and outputs together with the specific objectives to be achieved and activities to be carried out. Below you will find a diagram and subsequent explanation of the PRINCE2 processes to help guide you when managing projects with PRINCE2. Leading accredited training organisation ILX Group also provide a free comprehensive PRINCE2 process model poster available for you to download and use as a quick reference on your desk or wall! See the PRINCE2 download centre for many more useful PRINCE2 resources, available for free from ILX Group. If you require PRINCE2 training there are two PRINCE2 qualification levels you can get accredited for: PRINCE2 Foundation and PRINCE2 Practitioner. PRINCE2 Foundation level is for those with a requirement to learn the basics and terminology of PRINCE2. A PRINCE2 Foundation qualification can be reached with ILX's renowned PRINCE2 Foundation online learning or a three day PRINCE2 Foundation tutor-led classroom course . PRINCE2 Practitioner is the highest level qualification and is suitable for those with the need to manage projects within a PRINCE2 environment. A PRINCE2 Practitioner qualification can be reached with the ILX combined PRINCE2 Foundation and Practitioner blended package or a combined PRINCE2 Foundation and Practitioner five day tutor-led classroom course . If you don't wish to enter the classroom you can purchase PRINCE2 Practitioner Plus which combines both Foundation and Practitioner online learning. Directing a Project runs from the start-up of the project until its closure. This process is aimed at the Project Board. The Project Board manages and monitors via reports and controls through a number of decision points. 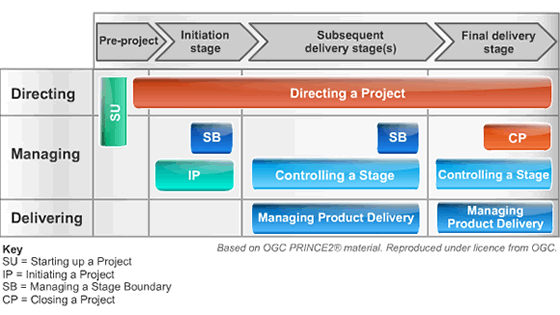 This is the first process in PRINCE2. It is a pre-project process, designed to ensure that the pre-requisites for initiating the project are in place. The process expects the existence of a Project Mandate which defines in high level terms the reason for the project and what outcome is sought. Starting up a Project should be very short. This process provides the Project Board with key decision points on whether to continue with the project or not. This process describes the monitoring and control activities of the Project Manager involved in ensuring that a stage stays on course and reacts to unexpected events. The process forms the core of the Project Manager's effort on the project, being the process which handles day-to-day management of the project. PRINCE2 recommends three levels of plan to reflect the needs of the different management levels involved in the project, stage and team. Planning is a repeatable process and its activities are included within the seven main PRINCE2 processes, as appropriate. Information about plans and how to plan can be found in the Plans Theme section of the PRINCE2 Manual. These four activities are performed within the ‘Define and analyse the products’ activity above.